We are approved by the Alaska Department of Commerce to offer the Mechanical Continuing Education you need, as @ 1 Attempt (Sponsor #15064)! Take the continuing education to renew your AK Mechanical license today. All of our courses can be completed At Your Pace Online to help you meet the state's requirements to maintain your license. Once you finish your class you will have an official certificate of completion to save for your records. In the state of Alaska, Mechanical Administrators (HVAC) must obtain 8 hours of continuing education. Continuing education hours must all be on Code topics. CE must be attained by December 31st, of every odd-numbered year. This course is approved with the State of Alaska to meet your continuing education requirements for your Mechanical Administrator License! This 8-hour course is a review of the significant changes between the 2009 and 2012 IMC (International Mechanical Code). 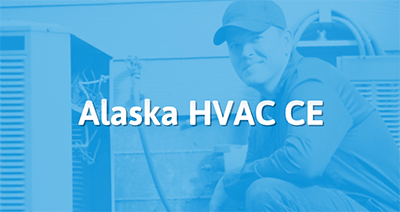 This course is designed for all licensed HVAC contractors and administrators in Alaska and provides the full 8 hours of approved continuing education required to renew an HVAC Administrator's license. Topics covered include licensing rules, all Alaska amendments to the IMC, and a survey of significant changes made to the IMC during 2012-2015 code review cycle. I am pleased to inform you that the Division of Corporations, Business and Professional Licensing has approved the course listed below for continuing education for Mechanical Administrators and/or Journeyman Plumbers. Mechanical Administrators in the State of Alaska are required to obtain eight hours of UPC and/or eight hours of IMC continuing education depending upon their license category (ies), every two years, based on the current state adopted codes or their later revisions. Journeyman Plumbers in the State of Alaska are required to obtain 16 hours of continuing education with at least 8 hours of UPC code credit. To be approved for continuing education credit, courses must be based on the codes currently adopted by the State of Alaska.